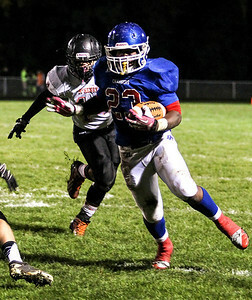 Sarah Nader- snader@shawmedia.com Dundee-Crown's Malik Dunner runs 53 yard for a touchdown during the second quarter of Friday's game against McHenry in Carpentersville October 18, 2013. 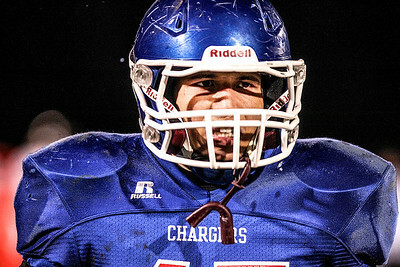 Dundee-Crown defeated McHenry, 49-21. Sarah Nader- snader@shawmedia.com Dundee-Crown's Malik Dunner (left) is tackled by McHenry's Kyle Postal during the second quarter of Friday's game against McHenry in Carpentersville October 18, 2013. 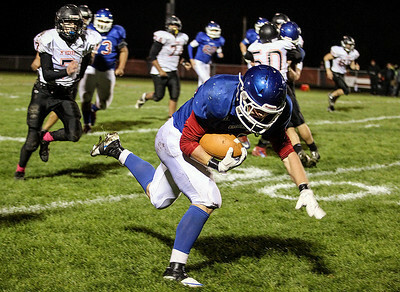 Dundee-Crown defeated McHenry, 49-21. Sarah Nader- snader@shawmedia.com McHenry's Payton Lykins runs a play during the first quarter of Friday's game against Dundee-Crown in Carpentersville October 18, 2013. 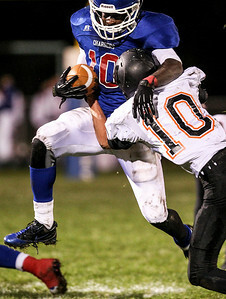 Dundee-Crown defeated McHenry, 49-21. Sarah Nader- snader@shawmedia.com Dundee-Crown's Cordero Parson runs a play during the third quarter of Friday's game against McHenry in Carpentersville October 18, 2013. 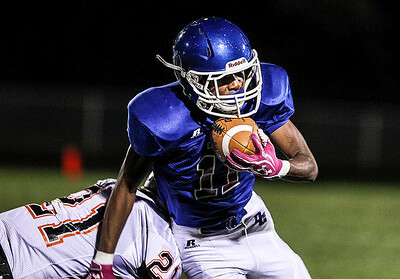 Dundee-Crown defeated McHenry, 49-21. 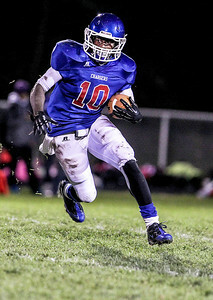 Sarah Nader- snader@shawmedia.com Dundee-Crown's Caleb Parson runs a play during the third quarter of Friday's game against McHenry in Carpentersville October 18, 2013. 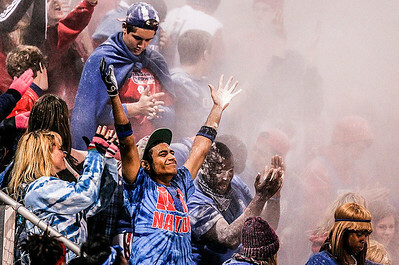 Dundee-Crown defeated McHenry, 49-21. 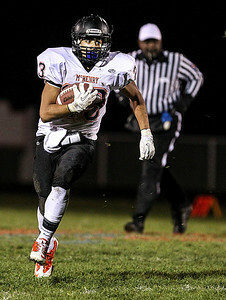 Sarah Nader- snader@shawmedia.com McHenry's Jordan Johnson runs a play during the first quarter of Friday's game against Dundee-Crown in Carpentersville October 18, 2013. Dundee-Crown defeated McHenry, 49-21. 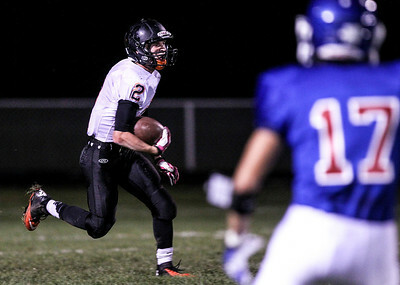 Sarah Nader- snader@shawmedia.com Dundee-Crown's T.J. Moss scores a touchdown during the second quarter at Friday's game against McHenry in Carpentersville October 18, 2013. Dundee-Crown defeated McHenry, 49-21. Sarah Nader- snader@shawmedia.com McHenry's quarterback Mike Briscoe throws a pass during the second quarter of Friday's game against Dundee-Crown in Carpentersville October 18, 2013. Dundee-Crown defeated McHenry, 49-21. Sarah Nader- snader@shawmedia.com Dundee-Crown fans cheer for their football team during Friday's game against McHenry in Carpentersville October 18, 2013. Dundee-Crown defeated McHenry, 49-21. 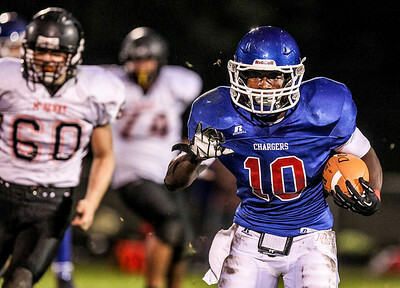 Sarah Nader- snader@shawmedia.com Dundee-Crown's Kiwaun Seals runs a play during the first quarter of Friday's game against McHenry in Carpentersville October 18, 2013. Dundee-Crown defeated McHenry, 49-21. 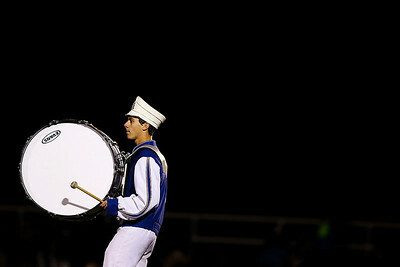 Sarah Nader- snader@shawmedia.com Dundee-Crown's Jordan Linson watches the game during Friday's game against McHenry in Carpentersville October 18, 2013. Dundee-Crown defeated McHenry, 49-21. 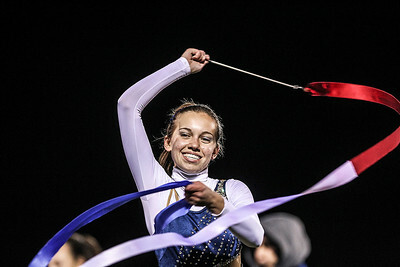 Sarah Nader- snader@shawmedia.com The Dundee-Crown marching band performs during half-time at Friday's game against McHenry in Carpentersville October 18, 2013. Dundee-Crown defeated McHenry, 49-21. 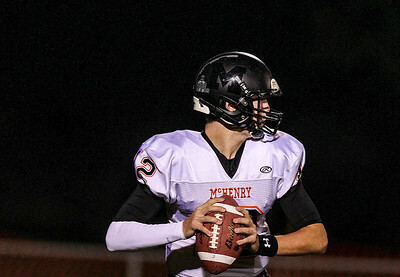 McHenry's quarterback Mike Briscoe throws a pass during the second quarter of Friday's game against Dundee-Crown in Carpentersville October 18, 2013. 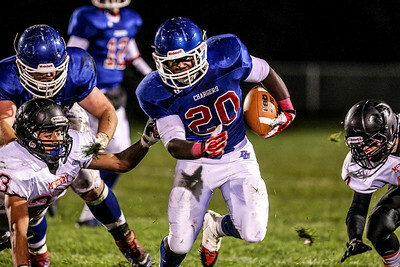 Dundee-Crown defeated McHenry, 49-21.